FLX Weather Meteorologist Drew Montreuil says Friday will shape up to be a nice weather day — but will feel a touch cooler than Thursday. As high pressure builds in today, temperatures will struggle to get through the mid-60s. 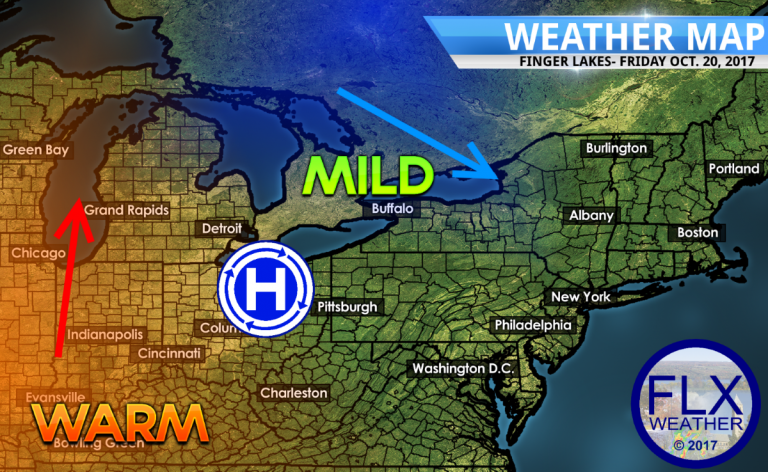 That said, an incredible weather weekend is on tap here in the Finger Lakes — and Montreuil says that will be due to the movement of a high pressure system to the east of the region. Both Saturday and Sunday will feature temperatures in the mid-70s with plenty of sun and no chance of rain. Interestingly, the region is getting near drought status, according to the latest reporting from the Drought Monitor. The region remains “abnormally dry” and that trend won’t change until the region sees some soaking rains. Sunny, with a high near 76. South wind 5 to 7 mph. Mostly clear, with a low around 56. South wind around 9 mph. Sunny, with a high near 74. South wind 7 to 10 mph. A chance of showers before 3am, then rain likely after 3am. Cloudy, with a low around 59. Chance of precipitation is 60%. Rain. High near 66. Chance of precipitation is 80%.